Need to take a bottle of wine to a party and want to stand out from the rest of the bottles the host gets? Well, you could show up with a nicely aged bottle of Opus One, which should only set you back a few hundred bucks… or, you could grab a bottle something way more pedestrian and slap a $3.95 Cerebral Itch wine label on the bottle. These labels will cover most original labels entirely, and their humorous designs will demonstrate that you are a guest with a wit. An added bonus is that the labels have a space to write who the bottle is from. As an occasional party-giver, I often find a bottle brought by a guest that was delivered with no card or got separated from its wine-bag. The Cerebral Itch wine labels will ensure that you get full credit for your hostess gift. Of course, if you used the label to cover up a bottle of Two Buck Chuck, letting the hosts know who brought it may not be at the top of your priority list. Cerebral Itch offers dozens of designs to celebrate occasions ranging from birthdays to divorces. The labels can be removed without damaging the original label. 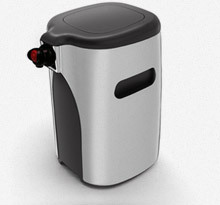 This entry was posted in Wine Accessories, Wine News on January 5, 2009 by Roger. We’re about to venture into the world of Argon wine preservation… We’re ordering the gas injection system (which comes with two stoppers) and some addtional cartridges. These are shown below. We’ll report back on our findings. The PEK argon gas cartridges can be used on any PEK wine preservation product to help preserve your open bottle of wine for a week or more. Each argon gas cartrdige preserves approximately 15 open wine bottles and works by flooding your wine bottle with inert gas. Use recommended bottle stopper and place your bottle in airtight chamber. PEK not only prevents oxidation but it controls the temperature of your wine with ease. Set of 4 Argon gas cartridges Actual life of cartridge will vary depending on the amount of wine left in each bottle being preserved. Additional PEK wine preservation stoppers specifically designed for the PEK Preservino portable wine preservation system. Sold as 2 per package. This entry was posted in Wine Accessories on March 1, 2007 by Roger.